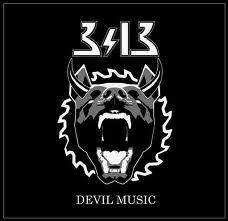 Hall of the Mountain King: Review: Three Thirteen, "Devil Music"
Review: Three Thirteen, "Devil Music"
I’ll say this for Three Thirteen. They know how to appeal to me. The packaging of their last album, Full Tilt, caught my interest as much as the music. While their latest, Devil Music, a set of covers to hold fans over until the next record, arrived in a slip case, it came with lots of candy – a poster, some postcards and a cut-out and fold cardboard Three-Thirteen race car. Most are fairly faithful covers. You’d expect no less from a band that expressed it’s appreciation for some of these bands so openly on its debut. The exceptions are “We’re Not Gonna Take It” and “Ramble On.” The Twisted Sister cover, they play as more of a punk number, and to me, it doesn’t work. It’s the only song on the record that I don’t really care for. “Ramble On” sticks closer to the Zeppelin melody, but transforms it from the folksy tune it was to more of a rocker. I actually like the treatment. When they don’t mess with the original, they still manage to be able to make the songs their own, with some small touches. The most notable and entertaining, perhaps, being their working of a verse of Zeppelin’s “Black Dog” into “Caught in a Mosh.” Everything, of course, gets a coat of 1980s shine, but in a good way. I didn’t think I’d like their version of “Beer Drinkers and Hell Raisers,” that being one of my favorite Top tunes, but it grew on me pretty quickly and is now one of my favorite tracks on the record. None of the songs match the originals, of course, but they’re not intended to. Three Thirteen main man Randy Weitzel understands well that you can’t do that, and doesn’t try. Devil Music does exactly what it was meant to – pay tribute, have fun and whet appetites for their upcoming release Overdrive Alive. For me, it succeeds on all three levels. Review: Shooter Jennings, "Family Man"
Review: Stephan Forte, "The Shadows Compendium"